Not much time these days for detailed blog research, but wanted to pass along some interesting links on the North Carolina US Senate race. We are about to become the center of attention for the remainder of this year as control of the US Senate hangs in the balance on just a few states - North Carolina being one of them. Here's what the major political analysts have to say on the race at this point. The Rothenberg Political Report and the Cook Political Report still have North Carolina tilting Democrat, but Larry Sabato at the University of Virginia recently moved North Carolina's race back to a pure tossup. Last week also saw some recent polling numbers from Public Policy Polling showing NC House Speaker Thom Tillis with a lead in the Republican primary. Combined with the Tillis campaign's large fundraiser numbers, many will be tempted to say the Republican primary race is all but wrapped up - exactly what the Republican establishment at the state and national levels want everyone to believe. But like any competition, the other side gets a vote - in this case that's the grassroots conservatives in the state. This post from the DailyHaymaker.com provides a very different take and some interesting insight into the recent poll numbers. It refers to discussions with pollsters from some unreleased polls, so there's no way to truly verify the conclusions. However, the Haymaker mentions pollsters showing surprisingly high negatives for Tillis in the greater Charlotte area. If true, that likely has some thing to do with the dynamics around the widening of I77 with tolls - something Thom Tillis has been supporting. Last June, we wrote here about that dynamic, and its potential impact on this Sentate race. With the toll road issue still lingering, it will be interesting to see how it ultimately impacts this race. That all takes us to this week. On Thursday, Republican candidates - except for Thom Tillis - are scheduled to meet in Huntersville for a forum put on by the new group - Lake Norman Conservatives. The new group has its genesis in the I77 controversy. Speaker Tillis apparently has a prior commitment like he has had for other candidate forums recently. His absence plays into a growing storyline that he's intentionally missing these local forums as a deliberate campaign strategy. See more on that idea from Davidson College blogger Cam Harris. Things are about to heat up! It will be fun to watch! So, there was a bit of confusion about what all was going to happen regarding the CHS Hospital when the Davidson Town Board got together Tuesday for its January meeting. The previous post from aShortChronicle strongly encouraged the Board to allow Commissioner Jenest to recuse himself from the rezoning vote. DavidsonNews.net had previously reported that there would be a "public hearing and a vote" at Tuesday's meeting on a rezoning request for the property to allow a sign that does not meet the town's sign ordinance. However, the vote on the rezoning is actually not going to happen until February - making our post here a little early. There was in fact a vote on Tuesday's agenda for the annexation of the property into the town. The previous post written here was based solely on the rezoning not the annexation. When DNN wrote it's story today on the Tuesday meeting, their story originally included a reference to the post from aShortChronicle as if it pertained to the annexation. It did not. DNN graciously made an update to their story after that was pointed out. Confused yet? And why does this matter? North Carolina law on recusals is unnecessarily confusing. Elected Commissioners can not just recuse themselves from voting on items if there is the mere perception of impropriety. There is a concept called the "duty to vote" which pretty much requires them to vote in any situation. The statute says. "No member shall be excused from voting except upon matters involving the consideration of his own financial interest or official conduct." The question is what is "financial interest"? In response to the first post on this subject from this site, Commissioner Rodney Graham responded to the piece on Facebook. Here is his comment and our response. Commissioner Graham - "3 or 4 years ago the Town Board voted to lower the property tax rate. Since all of them were property owners in the Town of Davidson and would be directly and favorably impacted by said reduction, should they all have recused themselves? Obviously, the answer is "no" but it illustrates a challenging question: just what is a direct benefit? Many people understandably believe that if any elected official has an interest, relationship or affiliation in an issue, no matter how direct or significant, they should be excused from voting on it. But, the LAW in North Carolina heavily leans toward the side of voting, so the law prescribes limited exceptions to voting, and as you might imagine those are subject to interpretation. None of this is to suggest how I might vote on any request to be excused from voting, but I wanted to make it clear that there are statutory guidelines as to when being excused from voting is permissible. Thanks for the article; there is some good information in it." Our Response - "You are correct, there is a "duty to vote" concept involved here. However, the tax rate example is actually a good one. In fact it's just that example sited by the UNC-SOG as a situation at the extreme end of a continuum where commissioners would NOT be recused precisely because they would all receive the same relative benefit from the vote. The decision tomorrow night (regarding the rezoning vote that did not occur) for Davidson's Board is not that type of situation. Any benefit from the decision tomorrow night accrues to only one Board member - putting it much further along the continuum where a commissioner should be recused. Add to that the fact that the Commissioner with the most direct knowledge of any financial benefit is also the one would be offering to recuse himself, and that seems to be a reasonable situation to approve the recusal. It's definitely a judgment call." So, here's the difference between the pending rezoning vote and this Tuesday's annexation vote. The annexation of property is a standard action taken by Davidson when property ties into local utilities and receives the benefit of town services. That's mentioned in the DNN story on Tuesday's meeting. Annexation would likely have happened regardless of who was on the Board and whatever firm was doing the work on the CHS property. Plus no Commissioner will receive any benefit from that, or if they do they will all receive the same benefit. The annexation is much more like the tax rate example that Commissioner Graham used. The Board was right to allow Commissioner Jenest to vote on it. The rezoning of the property is different because it is not a standard action, and it's being sought precisely to seek a variance from a town ordinance. Commissioner Jenest is a name partner in his firm. His client is seeking an exception of a town ordinance. Any benefit certainly accrues only to one person, not the whole Board. Voting to support an exception that benefits a client who is paying you to do work on a project and that overall project benefits from that exception would certainly appear to be at best a very gray area. There may not be a clause in the contract between ColeJenest & Stone and CHS that says "we will not pay you unless you get our sign variance approved", but as Commissioner Graham said these situations are "subject to interpretation." When the time comes to actually vote on this rezoning, it will be interesting to see how the Board interprets that situation. Our neighbors in Cornelius recently had a similar situation regarding a rezoning for the new Harris Teeter in Antiquity. Then-Commissioner Chuck Travis, an architect, recused himself for something much less direct, and he did not vote. Tuesday night, Davidson's new Board has its first real monthly meeting. The December meeting saw the new Board sworn into office. Now it's time to get down to business, and one of the first items Commissioners will tackle involves the new CHS behavioral health hospital on highway 73. Like it or not, this facility is controversial for some of the residents who live out that way, and Davidson's Board needs to handle this rezoning decision carefully. See here and here for some past coverage involving the site. This site and the process around how it came into existence also was big piece of the discussion at the Summers Walk candidate forum during the past election cycle. Davidson's Board likely will face two decisions on Tuesday involving this rezoning request. Each decisions provides an opportunity to support transparency in government. The first decision involves the likely request from Commissioner Bran Jenest to recuse himself from voting on the actual rezoning. His firm ColeJenest&Stone is doing work on the project. Based on email communication with Commissioner Jenest, he indicated that he "absolutely" intends to recuse himself. However, that does not mean he will be allowed to recuse himself. The rest of the Board will likely have to agree. Based on research done by the staff at the UNC School of Government, there are multiple State statutes involving when elected officials can recuse themselves. In most cases the standard is that a “direct, substantial, and readily identifiable” financial impact must be present for the elected official to be recused from voting on something. In the past Davison's other Board members have allowed Commissioner Jenest to vote in similar situations. See the vote on MSC's sign as an example. This is based on the idea that there is not "direct" benefit to Commissioner Jenest from this type of specific vote. However, it also seems reasonable that one could argue that as a name partner in the firm doing the work there certainly is benefit. Additionally, without knowing the exact details of the contract between Commissioner Jenest's firm and CHS, there is really no way of knowing if there is benefit. Understanding that Commissioner Jenest knows the rules as well or better than the other Commissioners since he's been through this on other issues, if he offers to recuse himself from voting on the rezoning, then the other Commissioners should take him at his word that his situation meets the standards and allow him to recuse himself. That brings us to the second opportunity for the Board to support openness and transparency in government. Regardless of whether or not Commissioner Jenest votes in the actual rezoning, the Board should deny this rezoning request. There are multiple reasons why this request should not be approved. First, it's not much of a secret that CHS was attracted to this parcel in large part because they were told they had "by right" privileges to build what they wanted without rezoning. They apparently accepted that. CHS did not want to experience any of the pushback they received when the facility was originally planned for Huntersville. Now that the facility is built, CHS coming back to ask for a rezoning of the entire property to Conditional zoning from its current Flex zoning seems like a bit of a bait and switch. They knew the zoning going into the project. They knew the town's sign ordinance. They should live within the current requirements. Second, Davidson makes a big point that all parts of town should be treated the same when it comes to planning and design. They should stick to that principle here. Also, the precedent of the MSC sign decision should not really apply to this zoning request. 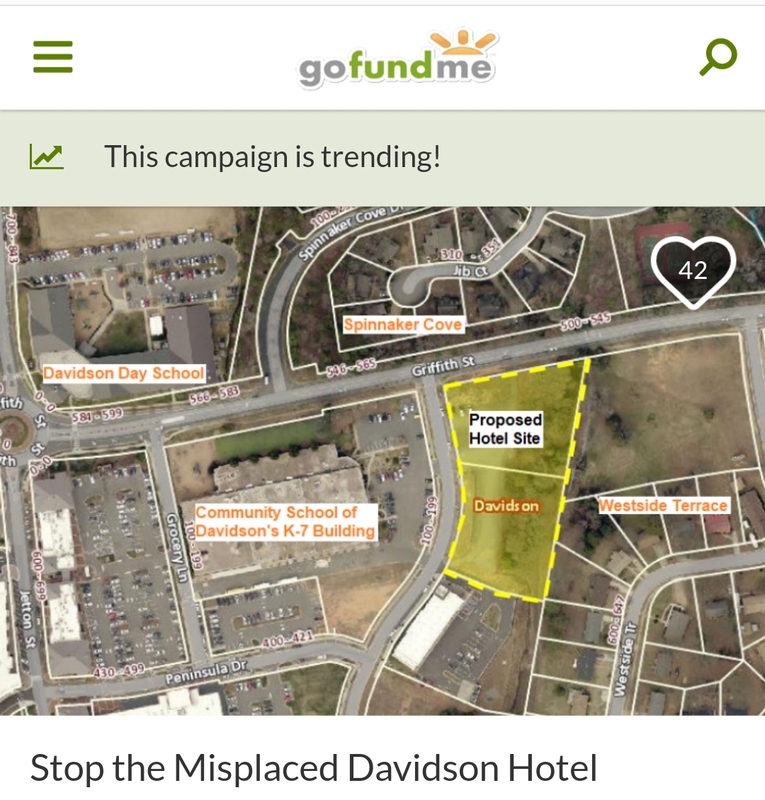 The MSC site is in the main commercial area of Davidson and it was argued at the time that MSC's sign request really impacted I77, not Davidson proper. On the other hand, CHS is on a main road driven by many Davidsonian's every day and the nearby development is almost entirely residential. Not allowing a lighted sign on this road best fits with the surrounding development. It also prevents changing the entire zoning designation for a simple sign change. Finally, and maybe most importantly, denying this petition would go a good way towards repairing what is a perceived lack of response to concerns from some folks on the east side of town regarding this site and project. How the Davidson Town Board handles these issues Tuesday will in some ways set the tone for the Board. It will be interesting to see how it goes. UPDATE: Based subsequent discussions, this zoning change will actually only impact the sign not the rest of the requirements under the existing zoning. This past week saw announcements from local candidates regarding this year's NCGA elections. With just a few weeks left before filing begins, things are sure to get interesting as the State and Federal election cycles ramp up. On Tuesday, State Senator Jeff Tarte (Rep) sent out an email blast announcing a long list of endorsements - including endorsements from three Davidson Commissioners - Brian Jenest, Beth Cashion, and Stacey Anderson. See here for the announcement and complete list. Not all that surprising is the absence from the list of Mayor Woods, Commissioners Graham, and Commissioner Fuller. If they were to endorse anyone in the upcoming general election cycle for the NCGA, I'd put my money on Democrat and Davidson local, Natasha Marcus, in the NC House 98 race to replace Thom Tillis. All three were pictured here at the campaign kick-off event in Davidson for Ms. Marcus with Mayor Woods doing the candidate introduction. Interestingly, Mayor Woods was listed as a "supporter" of Republican John Bradford in this announcement regarding his recent Cornelius campaign, but he's missing from the list of elected officials endorsing Bradford for the NC-98 race. 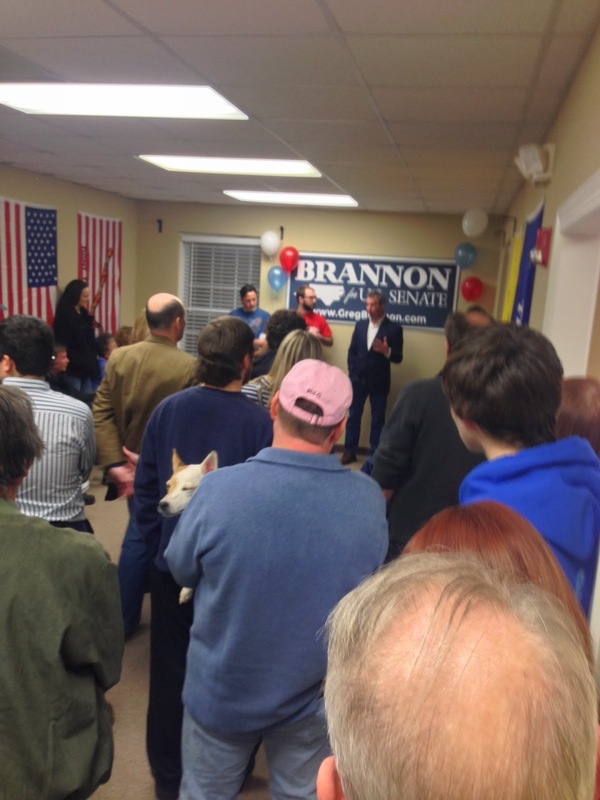 Speaking of the NC-98 race and John Bradford, Bradford's campaign announced an important appointment this week. Joshua Dobi will chair Bradford's election campaign committee. That name may sound familiar to readers of this blog. When Bradford announced his intention to run for this seat, we pointed out that local businessman Joshua Dobi had strongly urged voters to support Bradford in his recent run for Cornelius Town Board. "Choosing a CEO in a successful Lake Norman area business is a calculated decision"
Seems like there are a lot of "calculated decisions" going on. Then again, this is politics. Now that the holidays have come and gone, the new Davidson Board is about to get down to work in earnest over the next few weeks. With that, there are plenty of opportunities (big and small) to improve transparency in how our government works. To be clear, these things are easy. Not doing them is a choice. Publish Meeting Agendas Earlier - Per the town's own rules, Mayor Woods and Town Manager Leamon Brice control what goes on the meeting agendas. To allow citizens ample time to review these agendas prior to the Tuesday meetings, a commitment to publishing these agendas by close of business Friday would be a big improvement. This would allow citizens ample time to review and plan on whether or not they needed to attend the meeting. Drop "Team Building" Meetings - In late 2012, Davidson Commissioners started meeting in Commissioners' homes for "team building". These meetings are not currently on the 2014 meeting schedule, and it should stay that way. Meeting in private homes, while not illegal, does not support a spirit of openness and causes confusion as to the true purpose of these meetings. Agenda/Meeting Organization - Put items on the agenda with more public interest as early in the agenda as possible. Some of Davidson's Town Board meetings turn into marathons with important items like budget discussions not even beginning until hours into the evening. That in itself is not necessarily an issue, but since there is very little time management of the meetings people can not reasonably plan on attending closer to when a topic of interest is to be discussed. If the unnecessary "team building" meetings are dropped and replaced with a second work session, this meeting could handle some of the overflow discussion to shorten individual meetings. Support Local Businesses and Openness at the same time - The Town recently launched a new public relations push called "Turn around. Shop in town." It would be nice if the town practiced what it preached with spending for Town retreats. Later this month the Town Board will have it's annual retreat to discuss town management and plan for the coming year. Rather than have this year's retreat locally, the Town Board will be heading off to Mid-Pines golf resort for a 3-day meeting - far away from any prying eyes here in Davidson. This was planned before the last election, but going forward these should be done in town to the benefit of local hotels and other businesses. Those are the easy ones. They could all be done with a stroke of the pen so to speak. They are zero-cost efforts that would be tangible proof of a real desire to be as open and transparent as possible. There are others changes involving ethics, conflicts of interest, and inclusion which will require much more effort and political courage. However, those are topics for another day.